SKKA Student Ray B (one of our oldest students) performing a weapons kata (depending on your browser, you may have to refresh page if swf not working). Martial arts is good for all ages, young and old! The Bo is a traditional but effective and practical weapon of self defense today! Learn it from us! We offer you a special course only offered on DVD. Learn Blocks, strikes, attacks, and various swings that can leave your attacker on the ground! Along with this simple to learn course, you will receive an official certificate of completion. It's that simple to master! This course is excellent for the student to understand the basic fundamentals and the use of a cane as a weapon of self defense. You will learn a basic understanding of striking, blocking, and self-defense applications. This course is easy to learn and effective! Learn this awesome weapon of self defense today! Most people do not realize the full potential of this tool. It is also provides excellent deciption to the would be attacker. Learn this powerful weapons course in the kamas from the skka. Used as a farm tool, it was converted and used as an effective weapon overnight. The item itself is considered to be a sickle and is among traditional weapons of ancient karate. Learn the basice of this beautiful weapon of self defense. It is not as practical as the cane or arnis but it can certainly add to your knowledge of traditional weapons and expand your knowledge and teachings in your dojo or private teachings. You learn how to punck and strike your attacker, but do you know where to hit and strike? Learning where to strike your attacker is very important and without this knowledge your skills would not be worth much! Striking and knowing your targets go hand-in hand. Learn this ecourse today! You will receive this course via email in ebook form outlining what strikes to use and where they are effective! W A R N I N G This is for educational purposes only, some targets are dangerous and caution should be exercised at all times! Please read our disclaimer on our home page! This eourse is intended for the advanced in martial arts. A certificate of completion will be emailed to you with the course. Have you invented a martial arts style of your own? If you have worked hard in the martial arts for years studying various styles but now you want to branch out and discover a new style of your own, we can help. The SKKA International Academy has recognized hundreds of styles all over the World for over 15 years. 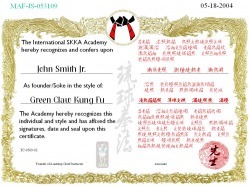 Our Academy will officially recognize you and Soke / Head Master of your own style. Upon ordering this esteemed certification, we would request that you send to us via email or snail mail a copy of your list of techniques for your new style and a brief martial arts resume. Upon acceptance, you will receive your framed certificate from us with a registration number officially recognizing you and your new style. You have worked hard to achieve this and you should be recognized for your hard work, innovation, and efforts. This is reserved for students of the SKKA Academy whom have blackbelt status in either of our styles (Shorinkenjitsu, American Tiger, or SnakeFist). Obtain an official Lineage chart from us. Each chart has a special assigned number and is prited on high quality gloss paper and officially signed. Be proud of your martial arts heritage, come on board, be recognized, your name will appear at the bottom. Purchasetoday, impress your friends and students! The SKKA has traditional as well as modern roots that go way back. The sample certificate above will be signed and numbered by us. All weapons courses includes a completion card (business size card). These weapons courses teach the fundamental basic which are extremely effective and are perfect if you want to learn a new self defense weapon and or offer something new to your school or dojo. There is no such thing as rank in a weapons course which is why you receive a completion card. You will not spend useless hours learning useless techniques, these courses offer insightful techniques and are impacted. They are extremely easy to learn. !Earn your black belt in martial arts from home on your own terms with no contracts!